More than a million people working in America’s fields, and far more globally, are about to face competition from workers who never sleep, get tired or ask for a living wage. As field robots have gotten cheaper, a steady stream of farm jobs are being automated. 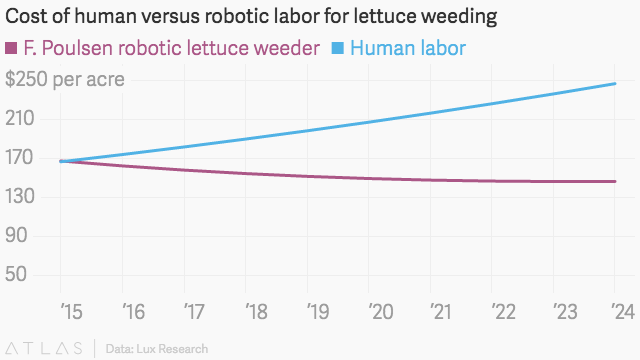 Lettuce weeding is one of the first where the cost of robots now matches human labor, reports Lux Research in a new analysis. Although costs remain too high for robots to replace most farm work for low-value crops, it’s a taste of what’s to come. Weeding lettuce is slow, expensive, and potentially dangerous due to chemical exposure. Farm workers must spray individual weeds from a pesticide-filled backpack. Automated systems like the one designed by Danish firm F. Poulsen Engineering replace this with mechanical weeding and computer vision to distinguish between crops and pests. The company says it can do the job much faster and at no extra cost. That hits the sweet spot for inexpensive machinery to replace high-cost labor. Robots will likely make inroads fastest in areas where the labor is backbreaking, and peak harvest times create a short supply of workers. Most robots have been built for specialized tasks: grapevine pruners, lettuce thinners, strawberry picking and cow-milking robots. But corn and other commodity crops are already taking advantage of economies of scale to get ahead of the cost curve. Large corn farmers in the US are buying features like self-steering tractors to save money. Even though the technology isn’t expected to reach price parity with human labor until 2020 for most farmers, about 10% of US farmer have adopted the technology because of their scale, reports Lux.